BRIDGTON — The assistant director of the Bridgton Historical Society is right: it’s not every day you get a letter from your ancestors. But thanks to a time capsule filled by Bridgton residents 50 years ago, local families have received some very delayed mail that took decades to deliver even though it never left town. When the historical society prepared to open the 1968 time capsule as part of the town’s 250th anniversary celebration on Saturday, July 7, they anticipated it would contain some sort of proclamation from the people who filled it. Instead, the nearly 50 letters, along with two old Portland Press Herald editions splashed with headlines about the first moon landing, were a pleasant surprise. “It’s not really what we expected,” said historical society Executive Director Ned Allen. Of the 46 letters, Davis said he was able to hand out about half to descendants who were at Saturday’s celebration, where they were met with levels of joy and confusion. He’s confident he can deliver the remaining letters, considering many of the families still live in Bridgton. The letters that have yet to be delivered are sitting at historical society unopened because they were “intended as a personal thing,” Allen said. Bridgton Selectman Fred Packard’s parents put a letter in the time capsule for him and his sister, and he is waiting to open it with her. Packard, who was 22 in 1968, said he is “thrilled” to have the letter from his parents. They turned to local engineer Frank Howell for help – and the effort to get into the capsule, much like its contents, became a generational exercise. Howell’s father, C.F. “Pete” Howell, designed the time capsule 50 years ago, and his team at Howell Laboratories built it. The younger Howell, 59, who is the owner and chief designer at manufacturing company Down East Innovation in Bridgton, was impressed by the capsule’s craftsmanship and initially flummoxed as to how to get into it. Howell, who was 8 when his dad designed the time capsule, spent a day pondering how to open the gray cube without destroying it or its contents. He eventually settled on using a computer-controlled milling machine to start the process of getting into the capsule from the top. He then finished with a cutter. Howell’s father designed the capsule under the assumption that it would be buried, though for reasons unknown, it never found its way below ground. The historical society wasn’t even sure where the capsule was until recently, Davis explained, when former Selectman Robert McHatton tipped the group off that it might be sitting in the town’s vault. In his planning, Howell worked diligently to open the capsule in a way that it can be reused and reopened in another five decades. “There will be a challenge 50 years from now to get it open,” Howell chuckled. Davis and Allen said the historical society originally planned to immediately place new items and reseal the capsule last Saturday, but decided to give the Bridgton community a little more time to submit items. “We’re trying to include a broader scope of things,” said Davis, who as of Monday, July 9, was planning to extend the submission deadline at least through the end of this week. Davis, who is 21, hopes to be around in 50 years when the capsule is opened once again for Bridgton’s 300th anniversary. 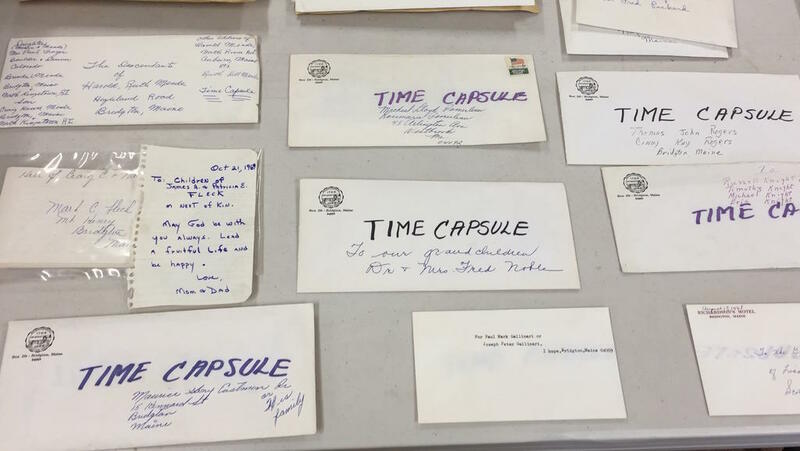 Letters from the late 1960s that were found inside a time capsule opened in Bridgton July 7 as part of the town’s 250th anniversary celebration. 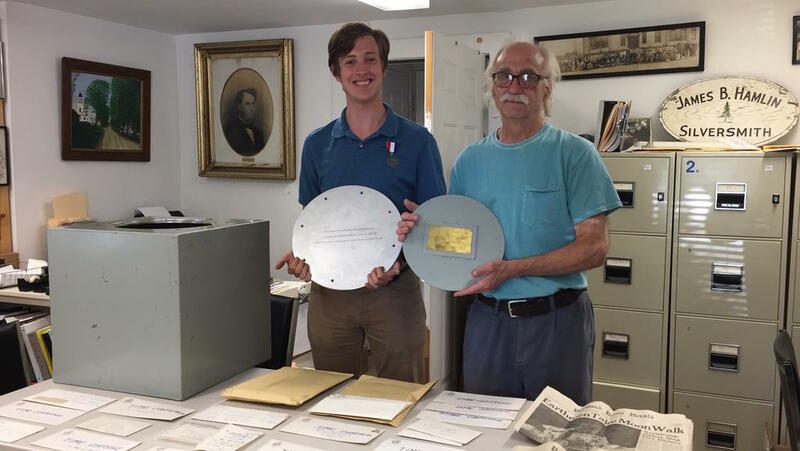 Bridgton Historical Society Assistant Director Mike Davis, left, and Executive Director Ned Allen, were surprised to find nearly 50 personal letters within a time capsule from the late 1960s. The letters were from members of the Bridgton community and addressed to their descendants.